I'll guess it won't take long before this is fixed, or switched correctly, but at the moment it's a bit weird. On my desktop Google+, I received the new notification today. The bell on top and the drop down window split into new and previously read notifications. 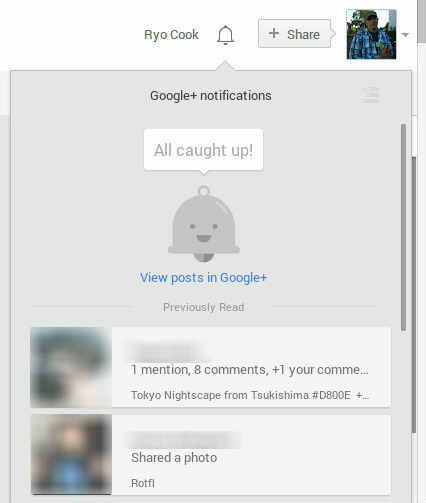 I got the new Google+ app 4.0+ for quite some time on my phone and tablet, but both never had the new notifications. Not only that, after the switch on desktop, it's still the old way. Looks like I'm not the only one with this problem, and it seems Google needs more time to switch everything to the new look. Did you receive the new version on both desktop and mobile by now? Update 06/21/2013: It's now on all of my devices, taking this problem to rest. Everything works fine now. Like I thought, it only took some time to roll out this feature to the different platforms.